Keep up to date of all Rons upcoming shows through his myspace page. Shayari: n. (shy-ree) / In Urdu, Shaayaree is a type of poetry believed to be first heard in the courts of the Mughal Kings. Consisting of couplets, it is a highly stylized form of verse and considered extremely beautiful. In Hindi, it is written Shyree. Multi-talented saxophonist Ron Blake inhabits many worlds – and nowhere is this more apparent than on Shayari, Blake’s third release on MACK AVENUE. Highlighting performances by Jack DeJohnette, Christian McBride, Michael Cain, Regina Carter and Gilmar Gomes, Shayari reveals the complexities and innovation of Ron’s musicianship. He is an in-demand session and group player (Meshell Ndegeocello, Saturday Night Live Band), a forward thinking band leader, an educator recently named to the faculty of Juilliard, and a seasoned live performer whose stage presence captivates. Produced by Michael Cain, Shayari combines fertile ground from each of Ron Blake’s worlds to create an extraordinary landscape of its own. 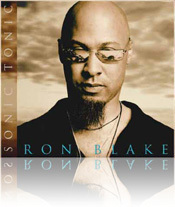 On "Sonic Tonic" saxophonist Ron Blake continues to craft his innovative fusion of funk, Latin and Caribbean rhythms with a traditional jazz sound. Joining Blake are some familiar friends, including Christian McBride on bass, Chris Dave on drums and Mack Avenue label-mate Sean Jones on flugelhorn.